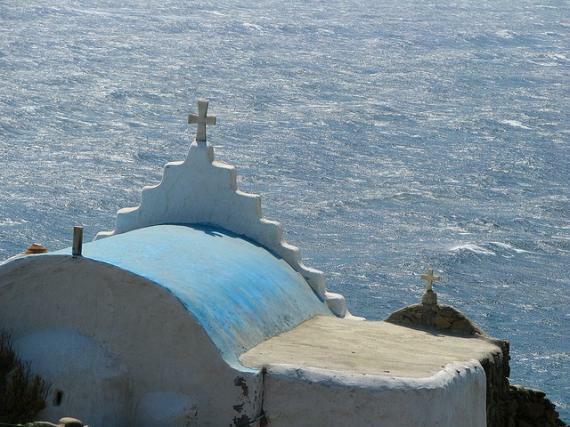 Agios Stefanos (St.Stefanos) is located northwest of Mykonos Town and within 3km, is a small village, named after the chapel on the beach that is built on the edge of the bay. The exact date of foundation is not known. However refers to manuscripts reveal that is over than 500 years. The area is growing rapidly in recent years, so you will see a lot of tourists. Come join them! Here there are many old churches, like St. Gioras of Michalovitis and St. Gioras the Spilianos. You can go to light a candle, admire the holly pictures and the architecture as well. St.Stefanos beach is quiet, it is protected from the winds (yes, here you can enjoy your nice hairstyle) and offers various water sports facilities.The beach is ideal for families, with a few sunbeds, umbrellas and delicious seafood at the restaurant located on the top of the beach. Dress casually, stroll through the narrow streets, take photos from the white houses that look like they have come out of postcards, get a tan under the bright sunshine. When the evening comes, sit at the tavern near the beach, eat slightly and do an evening swim watching the breathtaking view. The area is quiet enough so you don't have many options for fun, but the beautiful scenery is magical! Take your time and relax, after all your are on vacations! DO: Take your children and play with them in the sandy beach. Your... sand castle will be safe because they are no waves. DON'T: Think that Mykonos is all parties. There are places like St.Stefanos where you can -as music group Depeche Mode put it- enjoy the silence. Find information about selected Hotels, apartments and rooms in Agios Stefanos to choose the perfect place for your accommodation.